Baroness Hale of Richmond will succeed Lord Neuberger of Abbotsbury as President of the UK Supreme Court, it was announced today, alongside three additional appointments to the UK's top appeal court. 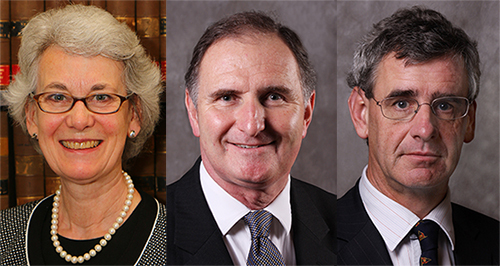 Lady Justice Black, Lord Justice Lloyd-Jones and Lord Justice Briggs will all join the Supreme Court as Justices on 2 October 2017, the same date that Lady Hale will be sworn-in officially as President. Lady Hale was brought up in Richmond, North Yorkshire, where she attended Richmond High School for Girls, a state grammar school. After graduating from Cambridge, Lady Hale taught law at Manchester University from 1966 to 1984, also qualifying as a barrister and practising for a while at the Manchester Bar. She specialised in family and social welfare law and was founding editor of the Journal of Social Welfare and Family Law. In 1984 she was the first woman to be appointed to the Law Commission. 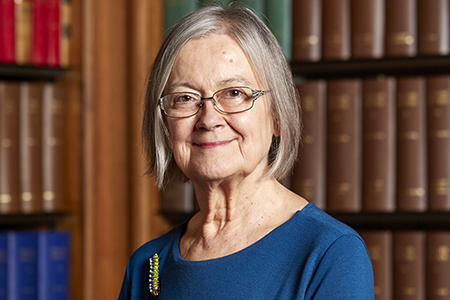 Lady Hale became the United Kingdom's first female Lord of Appeal in Ordinary in January 2004, before the establishment of the Supreme Court in 2009, following five years sitting in the Court of Appeal and five years as a High Court judge. She has been Deputy President of the Supreme Court since June 2013. "It is a great honour and a challenge to be appointed to succeed Lord Neuberger. I look forward to building upon his pioneering achievements, including developing closer links with each part of the United Kingdom, for example by sitting outside London, and improving the ways in which we communicate our work to the public. Recent high-profile cases mean that more people than ever before have heard of the Supreme Court, and we hope that this will help to create a broader understanding of how the judiciary serves society," said Lady Hale. "While I of course look forward to working alongside all my colleagues, it is a particular pleasure for me to be taking up the post at the same time as we welcome only the second ever woman to sit on the UK's top appeal court," she continued. Lady Justice Black attended Penrhos College in North Wales before studying at Durham University. The first lawyer in her family, her initial career at the Bar involved a broad range of criminal and civil work, although she later specialised in family law. For a period in the 1980s she taught law at Leeds Polytechnic. She was a founding author of the definitive guide to family law practice in England and Wales, and continues to serve as a consulting editor. Lady Justice Black was appointed to the High Court in 1999, assigned to the Family Division. In 2004 she became the Chairman of the Judicial Studies Board's Family Committee, until her appointment as a Judicial Appointments Commissioner in 2008, where she served until 2013. Lady Justice Black was appointed a Lady Justice of Appeal in 2010. She is currently the Head of International Family Justice. Lord Justice Lloyd-Jones was born and brought up in Pontypridd, Glamorgan where his father was a schoolteacher. He attended Pontypridd Boys' Grammar School and Downing College, Cambridge. He was a Fellow of Downing College from 1975 to 1991. At the Bar his practice included international law, EU law and public law. He was amicus curiae (independent advisor to the court) in the Pinochet litigation before the House of Lords. Lord Justice Lloyd-Jones was appointed to the High Court in 2005. A Welsh speaker, from 2008 to 2011 he served as a Presiding Judge on the Wales Circuit and Chair of the Lord Chancellor's Standing Committee on the Welsh Language. In 2012 he was appointed a Lord Justice of Appeal and from 2012 to 2015 he was Chairman of the Law Commission. Lord Justice Briggs grew up around Portsmouth and Plymouth, following his naval officer father between ships, before spending his later childhood in West Sussex. He attended Charterhouse and Magdalen College, Oxford. A keen sailor and the first lawyer in his family, he practised in commercial and chancery work before being appointed to the High Court in 2006. He was the judge in charge of the extensive Lehman insolvency litigation from 2009 to 2013. Lord Justice Briggs was appointed as a Lord Justice of Appeal in 2013. He was the judge in charge of the Chancery Modernisation Review in 2013, and led the Civil Courts Structure Review in 2015 to 2016. He is currently leading the implementation of its recommendations, alongside serving as the civil justice partnership lead for the HMCTS Reform Programme. In January 2016 he was appointed Deputy Head of Civil Justice. Each of the appointments was made by Her Majesty The Queen on the recommendation of the Prime Minister and Lord Chancellor, following the recommendations of two independent selection commissions. The commissions consulted across each of the Supreme Court's three United Kingdom jurisdictions before making its recommendations, which were today welcomed by Lord Neuberger, President of the Supreme Court. "I have had the pleasure of working closely with Lady Hale over the last five years, and have seen at first hand the intellect and humanity with which she approaches the appeals which come before her, as well as her commitment to the rule of law, legal education and building public understanding of the work of the courts," said Lord Neuberger. "For Lady Hale to become President of the institution to which she has contributed so much is a fitting pinnacle to a truly ground-breaking career. She is joined by three new Justices, each of whom has led a distinguished judicial career and has a huge amount to offer the Court and the development of the law," he continued.